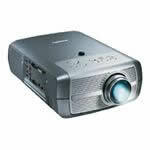 If you need to hire a video projector in Aberdeen then you are in the right place as Aberdeen Projector Hire have a range of professional projection equipment available for multimedia powerpoint presentation or any other usage. Aberdeen Projector Hire stock professional SVGA & XGA desktop / boardroom & install grade AV units which can be used with a wide range of input sources: They can be connected using a standard VGA cables (like a PC monitor), composite video (phono BNC connector), S-Video, DVI (Digital Video Interface) and will accept a wide range of input formats such as PAL (European standard), NTSC (USA standard) & SECAM. Our stock will work happily with a wide range of input resolutions, for instance, our most basic unit, the workhorse Mitsubishi SL4SU will accept VGA, SVGA, XGA or SXGA resolution inputs and translate into its native SVGA screen resolution. SVGA (in case you are unsure) is a computer screen standard and is 800 pixels wide by 600 pixels high. There is a slight loss of quality in the translation process but for most applications its fairly minimal. A unit such as the SL4SU (producing 1700 ANSI lumens light output) we would recommend for usage in boardroom / small meeting room size presentations, depending upon the circumstance for up to 30 people. It is worth noting that these units do not have on board speakers of any consequence, they are roughly comparable with those found on a laptop. We would often suggest that a small powered set of PC speakers are ideal for the smaller audio presentation situations. We have a range of useful & practical accessories available too. One of the most common requirements is a tripod screen, very easy to use and we do generally recommend use of a screen as it creates a greatly enhanced image (as compared to the same image on a plain white wall). This is due to the fact that the screen is designed to luminesce and reflects back about 50% more light than a plain white surface. We can supply DVD players, which are often used with a pre-prepared presentation or an autoplay, looping DVD - Perfect for advertorial, infommercial type placements! We will supply appropriate cabling (within reason) free of charge, for mains & image connections. We can, by arrangement, supply other accessories - please view our stock pages for details. Bookings & enquiries should be made on 0131 558 3824. Collection will be by appointment arranged from our Edinburgh offices. For clients who intend to use a notebook / laptop as an image source we would generally recommend that they bring this at the time of collection to ensure correct configuration for use with an external monitor as this tends to be the cause of 99% of usage problems. Please view our bookings page for more info on how to proceed or give us a call to discuss your requirements.